RUNNING SPACE - With a compact 47L x 15.6W running surface, its slimline yet you'll have plenty of run to walk or run for all types of users. INCLINE - 15 levels of Auto Incline at your fingertips. No need to disrupt your workout to adjust your incline, all while you run. SPEED - 0.5 to 9 MPH, this treadmill can accommodate any user, from beginners to elites, from walkers to runners. PULSE RATE MONITORING - Monitor and maintain your target heart rate. The more steady and prolonged the elevated heart rate is during the workout, the more fat is burned. TECHNOLOGY - With a Backlit LCD Display, 9 User programs, on-board speakers and Bluetooth I/O connectivity for music, youll have all you'll need to stay focused and on track. 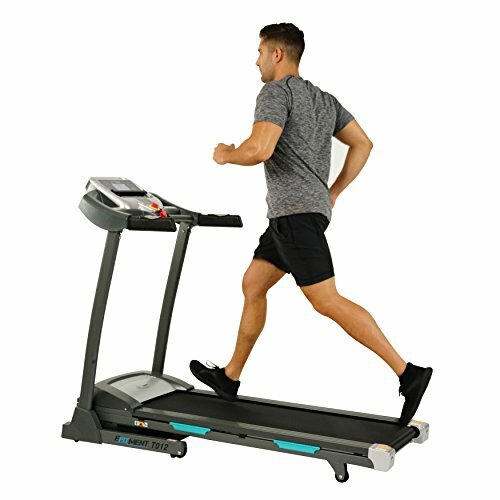 PORTABLE - With transportation wheels, folding capability with a "soft drop system" for safety, this treadmill doesn't have to be stationary anymore. Fold it up and wheel it away out of sight. TECHNOLOGY - With a Backlit LCD Display, 9 User programs, on-board speakers and Bluetooth I/O connectivity for music, youll have all you'll need to stay focused and on track. Plus it has 3 "Quick Speed" buttons to get you from walk, to jog, to run in the push of a button.....as well as 3 "Quick Incline" buttons.